I am super excited to share this recipe with you all today! In the past two years since moving to a plant based diet I have tried many vegan/plant based cheese sauce recipes. Some of them were down right awful and others were just okay. 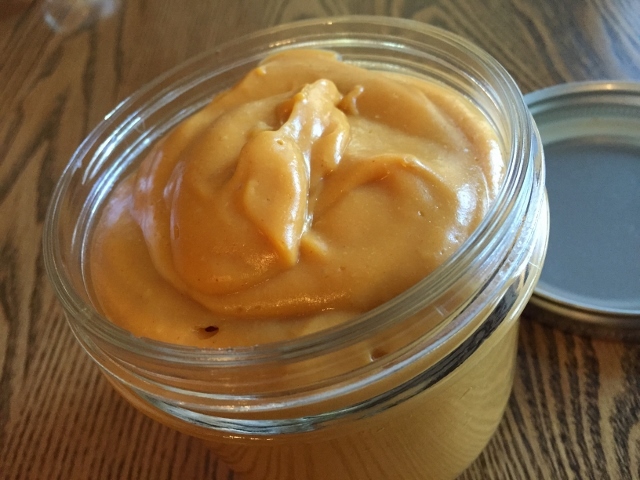 That all changed when my friend Donna Weifert shared her vegan cheeze sauce recipe that we have dubbed Donna’s Cheeze Sauce. This sauce is so delicious that I even made a batch of it to take in the cooler on our vacation. It has the most delightful cheezy flavor. The texture is thick like a rich cheese sauce. It heats up without separating and its a gorgeous color. Donna’s recipe calls for items you most likely have in your vegan/plant based pantry and freidge so you can whip up a batch of this miracle sauce right now! This is an oil free, dairy free, cholesterol free, low calorie cheeze sauce. What more could you want? Boil the potatoes and carrots until soft and drain. (I have also steamed them, microwaved them or used leftover baked potatoes and leftover cooked carrots.) Place the cooked potatoes and carrots and the rest of the ingredients in a high powered blender and blend until smooth. Add more water if its too thick. If it’s too thin add a little more potato. * If you want to make a nacho cheeze sauce add as much diced jalapeno to the mixture as you can handle! Store in the fridge. It lasts for a week or more – but you will most likely eat it all up before then! Thank you Donna for a fabulous recipe! Recipe by Donna Weifert and shared with her permission. See where I posted about how I use this cheeze sauce here. Hi Tami! The 4th ingredient just says “2 teaspoons”. Is that a typo or is there actually an ingredient missing? I’m looking forward to try this sauce. I’ve been seeing veggie based cheeze sauces but haven’t tried one yet. The color and texture look really lovely! Terri thanks for pointing that out – it was just a typo! Love this cheeze sauce and hope you do too! Be sure to come back and let me know. Do you happen to have instant-pot instructions for this recipe? Becky – that is so good to know – I will have to take a look! I love your changes – sounds wonderful. It is a learning curve but does get easier over time. Thank you for sharing your success with this recipe! Happy Cooking! Can you use this sauce for Mac and Cheeze? Hi Maureen – I haven’t used it for Mac and Cheeze so I can’t answer that! You sure can use this for mac and cheeze! I make a very similar recipe where you use 1 1/4 to 1 1/2 cup of the cooking water for making the sauce. It also calls for cashews, but uses fresh onion, no paprika,cayenne pepper or coconut aminos, but a little bit of salt. Now that I’ve seen this recipe I want to make it without cashews for a lower fat option! Hi Becky – thank you for sharing your experience with cheeze sauce! So good to know. I really like the lower fat option that this recipe offers for those of us who need to limit our fat intake. I just made this cheese cause today for the first time, and added about a tbs. of simply yellow mustard, which really kicked it up a bit. When I tasted it right out of the vitamix, it was a little flat, but the mustard amended it nicely. (For my taste only!) I always trust and try your recipes – best ever! I’m glad you tried the recipe and made it to suit your taste buds! Recipes are just a guideline and it’s fun to tweak them to our own liking!